The SpiderPro V2 Plates feature anti-slip rubber pads and are compatible with any tripod. 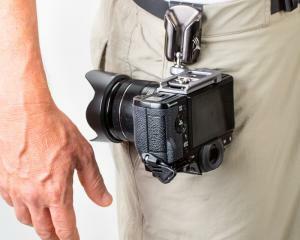 Spider Holster has released a new version of its SpiderPro camera holster, which was first introduced in 2009. The SpiderPro V2 adds anti-slip rubber grips to the plates that attach to the bottom of the camera or lens collar and a stainless steel anti-twist pin. The SpiderPro V2 Plate is designed to work with any tripod. The SpiderPro V2 Belt design is easily adjusted for size and comfort, fitting waist sizes from 28 to 50 inches. The SpiderPro Single Camera System V2 is $150; the Dual Camera System, which includes the lens collar plate, is $265. Additional variations are also available. Look for our hands-on review, coming soon. The SpiderPro V2 will be available in March 2018. An easy draw-from-the-hip, no-strap solution to take your camera anywhere.